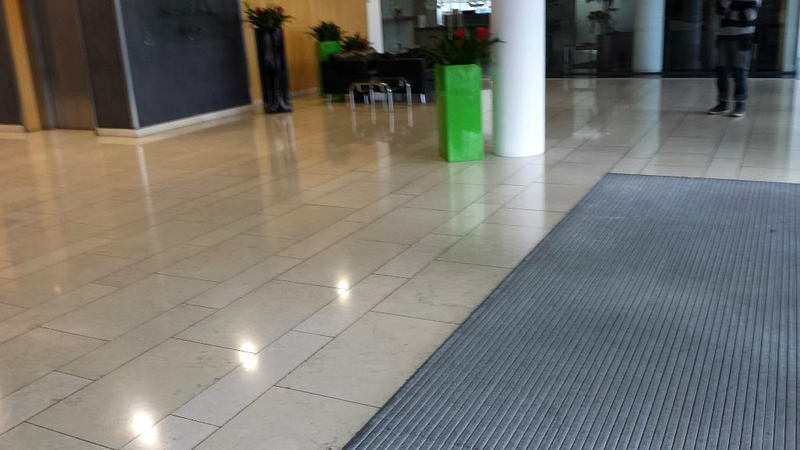 We were engaged by a commercial maintenance contractor to clean the large Limestone reception floor area of a very prestigious office building in the centre of Cardiff. The office’s main tenant is a bank and the owners were keen to restore the floor as they were letting out the remaining office space and keen to show off its potential to other businesses. 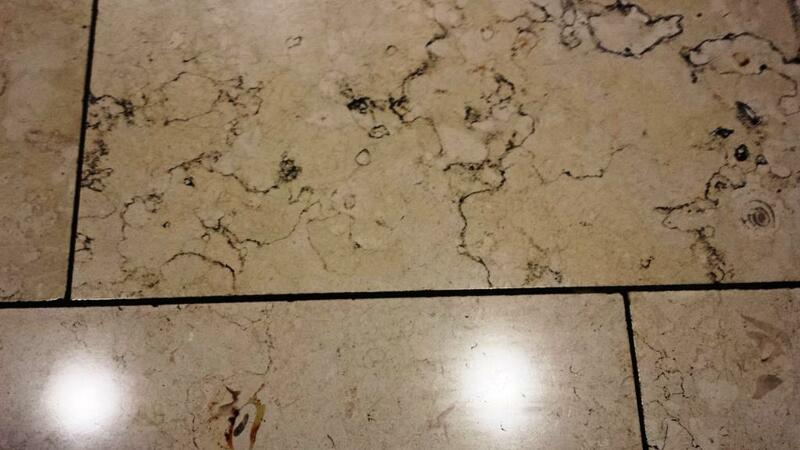 The Limestone floor had been laid in 2009 and naturally being a reception area had seen a lot of foot traffic and the standard cleaning process was struggling to keep pace with the ingrained dirt and would now need to be burnished with diamond encrusted pads to remove the ingrained dirt and bring back the polish. First went over the area with a very course black burnishing pad fitted to a rotary cleaning machine and a little water to remove the worst dirt and cleaned the grout lines with Tile Doctor Pro Clean in the process with a stiff grout brush. For stubborn areas I mixed in a little Tile Doctor Nanotech HBU which deals with the heavy build-up of dirt, rinsing and extracting the soil with a wet vacuum as I worked. Once the main ingrained dirt was lifted I moved onto the a medium burnishing pad which is the first step in restoring the surface back to its normal appearance; this was followed with the next pad in the sequence all the time lubricating with water as you go. The floor was then given a thorough rinse to remove any soil created by the processes and left to dry overnight. The next day the floor was given a final polish with the last burnishing pad which is super fine and then it was sealed including the grout lines with a couple of coats of Tile Doctor Colour Grow which impregnates the stone to prevent contaminates becoming ingrained into the tile, it also enhances the natural colours in the stone. Last step was a final run over with a buffing pad to ensure any blemishes were removed. 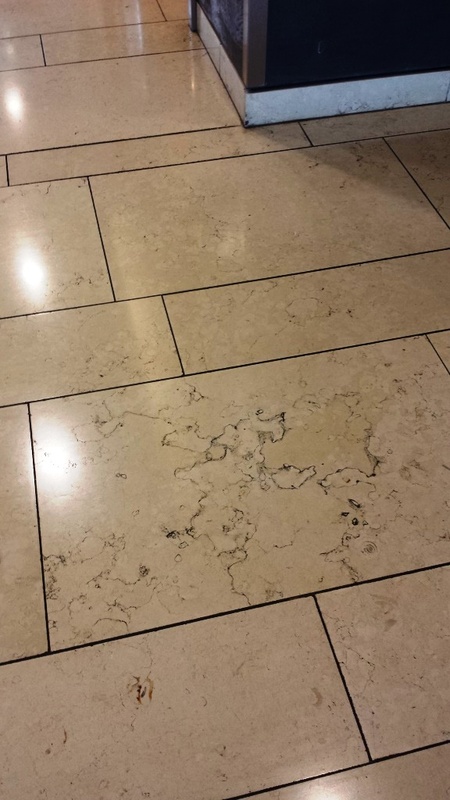 This entry was posted in Limestone Posts and tagged centre of Cardiff, limestone floor, office cleaning, polishing, South East Wales, tile cleaning, tile sealing by AbzDominise. Bookmark the permalink. Great improvement, the Limestone looks so much better.